Apples are one of the most popular fruits. They were purchased by 80 percent of consumers in 2006, according to The Packer’s Fresh Trends. apples are a healthy, fun snack for both adults and children. Apples have been found throughout most of recorded history. Many cultures creation stories include man living in a paradise filled with fruit trees. The apple has long been a symbol of temptation based on the biblical creation story where Eve tempted Adam with an apple. Apples are an important symbol in Greek mythology, included in the stories of Hera and Zeus and Helen of Troy. Apples originally were served as a dessert. From time of ancient Greece, apples were noted for their ability to aid digestion. It was a falling apple that led Sir Isaac Newton to discover the law of gravity. Braeburn ApplesThe Braeburn apple usually is orange to red in color on top of a yellow background. This apple is excellent for snacking and good in salads, pies, sauces, baking and freezing. These apples are available from October to July. Cameo ApplesThe Cameo apple has white spots on a red skin. This apple is excellent for snacking, salads, pies, sauces, baking and good for freezing. The Cameo apple is harvested in September and October and is available to consumers from October to August. Cortland ApplesThe Cortland apple is a sweet red apple over a greenish-yellow background that contains a hint of tartness. This type of apple is excellent for snacking, salads, pies, sauces, baking and good for freezing. The Cortland apple is available September through April. Empire ApplesA green and red apple that has a sweet/tart taste. The Empire apple is excellent for snacking and salads, a good apple for pies, sauces, baking and freezing. This type of apple is available year-round. Fuji ApplesThe Fuji apple is a sweet, reddish-pink apple that was introduced to the U.S. from Japan. This apple is excellent for snacking and good in salads, pies, sauces and baking. The Fuji apple is not a good apple for freezing. It is available October to August. Gala ApplesThe Gala apple has pinkish stripes over a yellow background. The sweet apple is excellent for snacking, salads and sauces. It is good for pies and baking. It is not a good freezing apple. Gala apples are available September to May. Ginger Gold ApplesThis early-season yellow apple has a sweet but mildly tart flavor. The Ginger Gold apple is excellent for snacking and salads. It is a good apple for pies, sauces and baking. The Ginger Gold apple is not a good candidate for freezing. 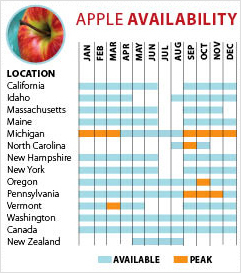 The variety of apple is available August through November. Golden Delicious ApplesThe Golden Delicious apple is a sweet, yellow apple that is a staple for all uses. This type of apple is excellent for snacking, salads, pies, sauces, baking and freezing. The Golden Delicious apple is available year-round. Granny Smith ApplesThis green, very tart apple is a favorite for many uses. The Granny Smith apple is excellent for use in snacks, salads, pies, sauces, baking and freezing. This type of apple is available year-round. Honeycrisp ApplesThe red and yellow Honeycrisp apple is a relatively new variety, making its entrance to the retail world in 1991. The sweet, crisp apple is excellent for snacking, salads, sauces and freezing. This apple is also good for use in baking, but it is not recommended for use in pies. Idared ApplesThis sweet/tart, pink apple is a versatile variety. This apple is excellent for use in pies, sauces and baking and good in snacking, salads and for freezing. This apple is available October through August. Jonagold ApplesA cross between the Jonathan and the Golden Delicious apple varieties, the Jonagold apple has a sweet taste with a touch of tartness. This type of apple is excellent for use in snacking, salads, sauces and baking, is good for freezing and pies. This apple is available October through May. Jonathan ApplesThe Jonathan apple is a red and green apple with a tart taste. This type of apple is excellent for snacking, pies and baking, is good in salads, sauces and freezing. McIntosh ApplesThis green and red apple has a sweet taste with a hint of tartness. This apple is a favorite in lunchboxes. This type of apple is excellent for snacking and in sauces. The McIntosh apple is also good for salads and pies but is not recommended for baking or freezing. This apple is available September through June. Red Delicious ApplesRed Delicious apple is a bright red apple with a sweet taste. This apple is good for snacking, salads and freezing. These apples are harvested in the fall and are available year-round. Rome Beauty Apples This mildly tart red apple is an excellent baking apple. This apple is excellent in pies, sauces and good for use as a snack or in salads and to freeze. Whole apples are sold in bulk where they can be purchased by the pound and in bags. Sliced apples are sold in consumer packs with or without dip as a convenient snack offering. Apples are harvested in the fall but sold throughout the year. The freshest apples can be found from August to November. After that, most domestic apples being sold are coming from controlled-atmosphere storage facilities. Off-season fresh apples are available as imports from New Zealand and Chile. To select apples, look for firm, well-colored apples. Apples do not ripen after being taken off the tree, so color is a good indication of ripeness. Remember that apple varieties come in many colors, so you need to know what variety you’re choosing to make a good color determination. Avoid overripe apples, which can be detected when an apple yields slightly when squeezed. Apples can be served as a stand-alone snack or in salads. Apples can easily be sliced in many different ways – they can be sliced, cut into sticks, cut up into tidbits or sliced for circular slices. They can be cored with a simple apple corer. Many apple peelers exist, but a paring knife can be used to quickly and efficiently peel an apple. Sliced apples have a tendency to brown quickly. Mix a quarter cup of apple juice with a cup of water and pour over the sliced apples to keep them from browning. When consumers think of baking apples, many minds go to homemade apple pie. Apples that keep their shape are best for making a pie. The absolute best apple for pie is up for debate, but good choices include braeburn, cameo, cortland, granny smith and jonathan varieties. Baking apples can be peeled for use in pies, cobblers and crisps, but the peels can also be left on for a different texture and flavor. To prepare apples for baking, slice them into the desired shape and use brown sugar or sugar to coat the apples. While adding butter to the apples adds fat and calories, it also adds flavor when the butter bakes into the apples. Add nutmeg and cinnamon to baked dishes for a tasty flavor combination. Good sauce apples will lose their shape and break into pieces when cooked. Good choices include golden delicious, McIntosh, cortland and jonathan. Good baking apples include jonathan, golden delicious, McIntosh and cortland. When making applesauce boil the apples until soft and then mash to desired consistency. Add spices like nutmeg or cinnamon to create flavored sauce. Adding strawberries to the recipe offers a complementary flavor package. Apples can be frozen with or without sugar. Slice and core apples. Add ascorbic acid to prevent the fruit from browning. Sugar or syrup can be added or they can be frozen by sampling placing apples in a freezer-safe container. Apples last longest when stored in the refrigerator. Apples are odor-sensitive; they will absorb odors from potatoes, bulb onions and other strong-flavored items, so keep them separate. Apples can also be sold in a combination of these grades. If you’re looking for a fat free, high fiber snack, apples are the way to go. Apples are fat free, saturated fat free, sodium free, cholesterol free and an excellent source of fiber. Apples contain pectin, which has been shown to aid digestion. Apples also contain boron, which helps harden bones. 1. The apple is the state fruit of New York, West Virginia, Washington and Rhode Island. 2. There are more than 7,000 varieties of apples. Only about 100 are produced commercially in the United States.